21 Days of Casino Promotions at InstaCasino During July! InstaCasino is preparing to launch a Tour De France themed month of promotions during July, the Tour De Insta launches on the 1st of July and see players compete in daily races with individual Time Trials, Flat, Hilly and Mountain Stages with prizes on offer that include extra cash, casino races with prizes for top places, and bag of RealSpins (free spins with no wagering) up for grabs. For players yet to register at InstaCasino you can now claim 25 Real Spins with No Deposit Required for the Spinions Slot by signing up to the casino, once registered you will then have access to their awesome welcome bonus package which includes a first deposit bonus of 100% up to £200 and 25 more RealSpins. 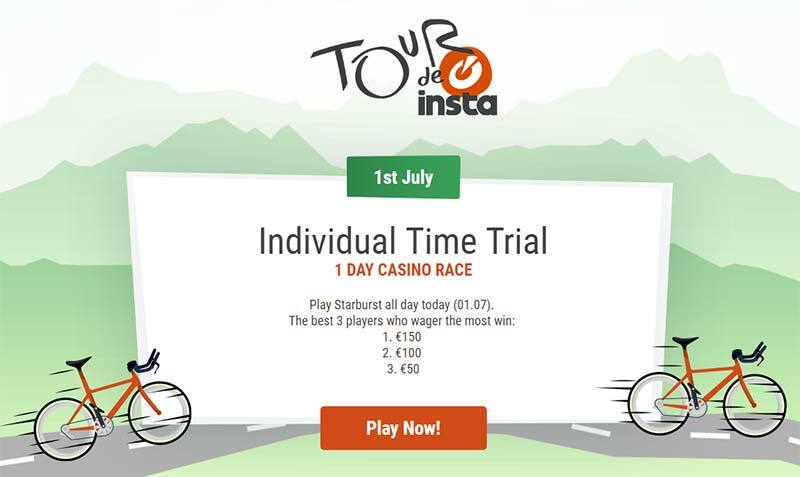 To take part in the Tour De Insta promotions simply log in to the casino and check through the special promotions section to see what the specific requirements for that day are, below we have included the Day 1 promotion which is a Starburst Slot Race with cash prizes up for grabs. Promotion runs from the 1st July for 21 days. Check the special promotions page each day for the daily offers/promotions. Join the Tour De Insta Now! Full terms and conditions will be listed on the InstaCasino Promotions section of their website once live.